In 2017, Counsilman-Hunsaker was retained by Ste. Genevieve County to develop conceptual options and scenarios being considered by the county. The Outdoor Aquatic Facility Feasibility Study identified the aquatic needs for the county and presented potential facility spaces that may meet those needs. Meetings were held with several stakeholder groups, as well as the Aquatic Facility Steering Committee. The county envisioned a facility that not only met the needs of swimmers in the community, but also provided a destination facility with unique amenities and features to attract visitors from outside the community. To meet the goals of the county’s vision, a variety of options were explored for aquatic centers ranging from small, medium, to large. The feasibility study provided a space program analysis and project costs for three conceptual options detailing site-specific construction estimates with line item costs for each proposed space. Along with each concept, the team provided a revenue and expense analysis to give a complete picture of what the facility would cost to build and operate. From the proposed options, the county chose a preferred option in which additional concept designs were explored. Pleased with the results from the study, the county decided to move forward with the design of the preferred option: a large family aquatic center with a budget of $10 million. The new outdoor aquatic facility will include a six lane, 25-yard lap pool, a 4,000 sq. ft. wading pool, a 13,000 sq. ft. lazy river, and a unique slide tower with multiple slides. The spacious deck space that surrounds and encompasses the water features allows for easy access to all areas while providing plenty of areas for lounging, sun bathing and an eating area. 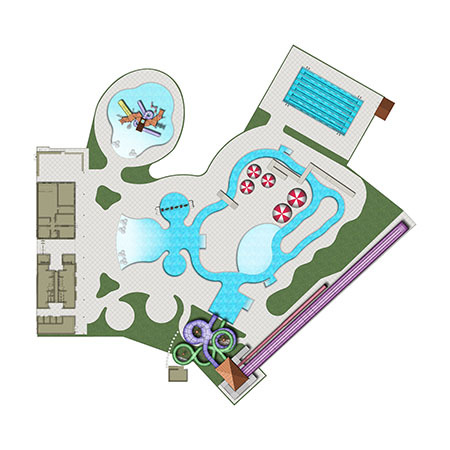 The water park will also have a support building that will house such spaces as the ticket entrance booth, admin space, family changing areas, showers, locker area, indoor party room, pool equipment room, concession, and support and mechanical spaces for the facility.